As I said in an earlier post, we discovered a great Hot Dog Joint called the Lucky Dog while vacationing in Venice, Florida. The first day we ate there, it was just me and the girls-I couldn’t drag my son away from the fishing pier even with the promise of lots of food. Since we enjoyed our meal so much, we went back a few days later with EVERYONE and met up with Marty Surak-Dawn’s husband-shown here with Kim(?) the server who had to deal with me and my ravenous children. 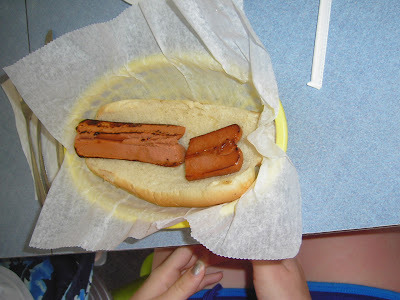 My veggyhead daughter ordered up a plain Tofu Dog which she actually liked! After eating it she was lobbying for me to carry them at the Hot Dog Truck. 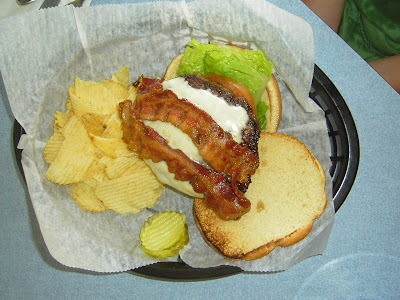 The cheeseburger princess struck again with another (equally delicious I am told) bacon cheeseburger. Another daughter had a very happy cheeseburger. 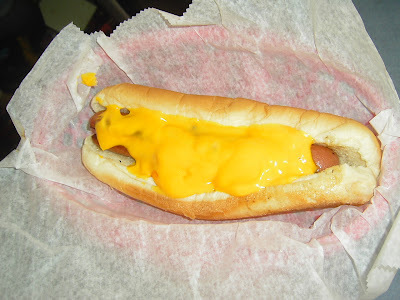 I just had one relish dog and the baby had another plain dog. My son went for the Jumbo Cheese dog- a foot long drenched with gobs of cheese. 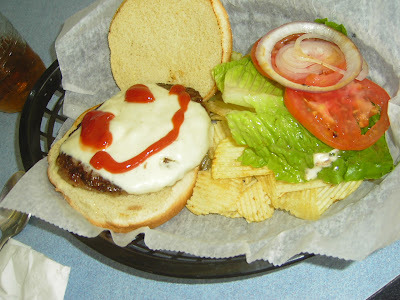 The Lucky Dog is a real slice of Americana with good hot dogs and cheeseburgers. The owners are real nice folks too. If you’re ever in Venice, FLA make sure you stop at the Lucky Dog. You won’t be sorry!